Comments: Single-Disc Remote CD Player, 18 inch Aluminum Wheels, Uconnect, 8.4 inch Touch Screen, Park Sensing System! This bright white crew cab 4X4 pickup has an automatic transmission and is powered by a 305HP 3.6L V6 Cylinder Engine. Our 1500's trim level is Big Horn. 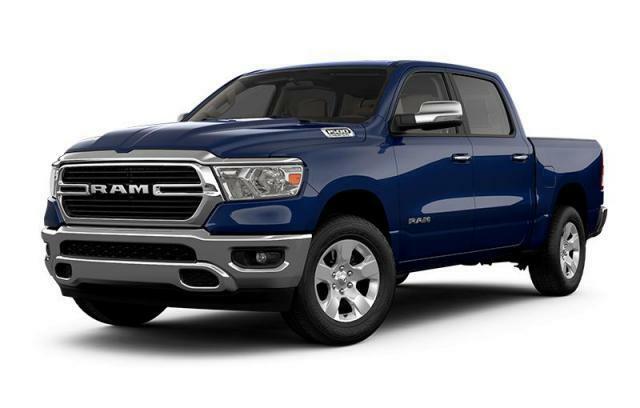 This Ram Big Horn offers a strong value along with nice features that make this hard working truck a little easier to live with. It comes with chrome bumpers, fog lamps, a sliding rear window, cloth seats, a Uconnect 3 five-inch display, an audio aux jack, remote keyless entry, power windows, air conditioning, cruise control, power door locks, a rear view camera, and more. This vehicle has been upgraded with the following features: Single-disc Remote Cd Player, 18 Inch Aluminum Wheels, Uconnect, 8.4 Inch Touch Screen, Park Sensing System, Remote Start, Siriusxm. View the original window sticker for this vehicle with this url http://www.chrysler.com/hostd/windowsticker/getWindowStickerPdf.do?vin=1C6RRFFG2KN642527. We've discounted this vehicle $5000. Total rebate of $10500 is reflected in the price. Includes $8,500 Consumer Cash Discount. Includes $2000 (after tax) Bonus Cash. 4.29% financing for 96 months. Payments from $540.23 monthly with $0 down for 96 months @ 4.29% APR O.A.C. ( Plus applicable taxes - Plus applicable fees ). Incentives expire 2019-04-30. See dealer for details.